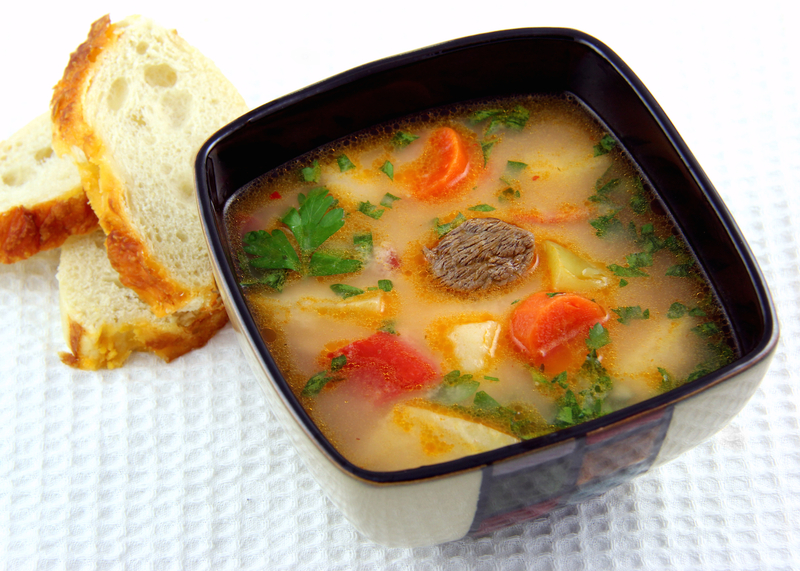 This is a tasty soup with many vegetables and occasional gifts of tender meat. As an extra bonus, the lemon flavor and the sour cream smoothness come to satisfy your craving for an ethnic touch. You really can't go wrong with this recipe, if you're looking for a simple recipe that you'd enjoy in a Romanian home. - Add the beef and one gallon of water to a big pot. Cover, bring to a boil, then reduce the heat to simmer (not a lot of bubbles): this helps keep the soup clearer. Cook the beef for an hour and a half, while periodically removing the foam. - While the beef is boiling, you have plenty of time to clean and dice the vegetables. You may want to keep them in cold water such that they stay fresh and don't change color (particularly the potatoes). - After an hour and a half of boiling the beef, remove it from the water, separate the meat and cut it in cubes, and discard the bones. Add the meat back to the soup, together with the diced carrots, parsnips, and celery root. Continue simmering for another 15 minutes. - Add the diced bell peppers, onion, and zucchini, and let them simmer for 10 minutes. - And the diced potatoes, and the tomatoes. Carefully mix the tomato paste in the hot soup until it becomes liquid (you can also remove a cup of hot soup, mix it with the tomato paste, then add it back to the soup). Continue simmering for 15 more minutes. - Remove from heat. Add the squeezed lemons, the chopped parsley, and sour cream, salt and pepper to taste. Mix, cover, and let the the flavors blend for 5 minutes. - If possible, choose a soup bowl that is wider and shallower - this helps some of the diced vegetables break through the soup surface to reveal nice colors and texture. - Have extra sour cream handy, if your guests want to add more. - Sprinkle chopped fresh parsley on top to an extra touch of freshness. - Serve alongside sliced bread and chili peppers (fresh or preferably pickled). Beef soup has always been my favorite. Me and my wife just love it. I guess I will show this to my wife and ask her to make this since its different.